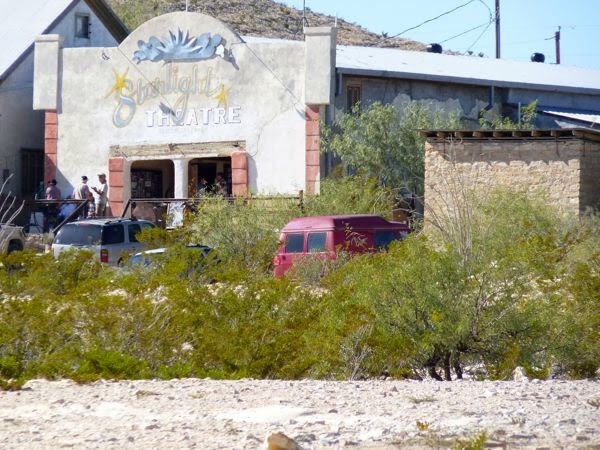 Not long after leaving Big Bend NP, I arrived at Terlingua; a semi-ghost town in the desert. I heard that it was a quirky kind of place that would be interesting. But, it turned out to not interest me much. Perhaps I was there at the wrong time, or needed to hang around a bit longer. The Starlight Theatre is the gathering place and watering hole for the locals and tourists. They were lined up on the front porch of the adjoining general store in chairs, visiting and drinking, and generally having a good ol’ time. The theatre, which has entertainment on the weekends, has been converted to a restaurant and bar. 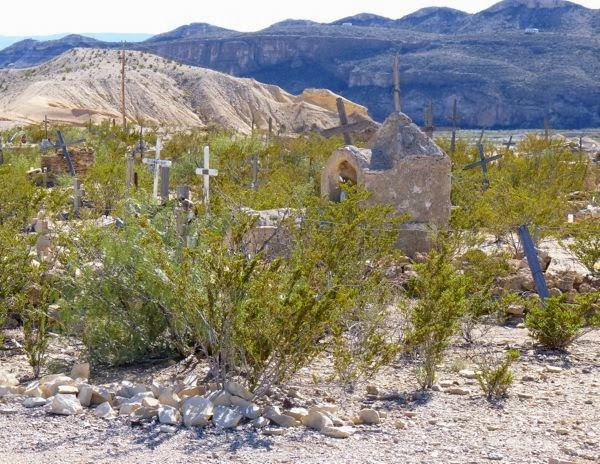 On the way out, I passed their ‘boot hill’ where they hold the annual Día de Muertos celebration; a day to remember family members that have passed away. It was late afternoon by the time I had checked it all out. Someone I saw back at Langtry had suggested the Chili Pepper Café would be good for lunch; and it was. I had a burrito with lettuce salad and ice tea for about $6. 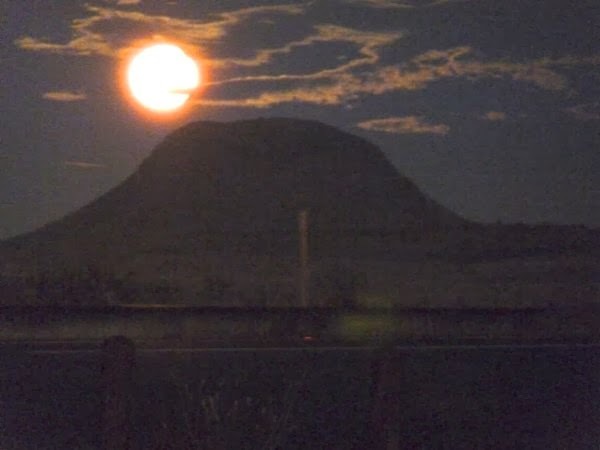 The Marfa Lights rest area is noted for mysterious lights often seen in the distant desert. First reported in the late 1800s, they were thought to be campfires. Over the years, sightings have continued with no apparent explanation for them, although many fantastic theories abound. They have built a balcony with free telescopes, plaques explaining the history of the area, and restrooms. Visitors are encouraged to find the lights, and to overnight in the parking area for free; which I did. Impossible to get a photo of the small lights I saw out in the desert, where there should have been none. So, the poor moon shot had to do. That night was supposed to be Leonids Meteor Shower. But there was a full moon, so I didn’t see any. Again, late at night it got quiet, except for an occasional train that would go by on the other side of the highway; not really a problem. In the morning, I had breakfast then hit the road again. Stopped in Van Horn TX for gas, and got on the interstate westbound through El Paso. I enjoyed my trip across the great state of Texas, and the sights were spectacular. But, it was time to say adiós Tejas. Cool stuff! I love Texas. Interesting about the Day of the Dead! That burrito sure sounds great right now, too! I’m really enjoying the travel notes while stuck here in Iowa waiting for Dad’s house to clean itself. 🙂 Great job on the blog! Thanks for the complement on the blog and pix. It’s a lot easier when the locations are so interesting. Hope all goes well for you.